When we explore the larger story of “the fall,” that first act of disobedience to God, we often focus on the attractiveness of sin. It’s not hard to construct reasonable-sounding arguments for why we should disobey God; sinful acts themselves can be quite alluring, at least initially. Today’s verses call us to examine the after-effects of sin. The false beauty projected by sin fades rapidly once we recognize sin as rejection of the source of all beauty, God. The loss in this story is incalculable; our text today opens with God arriving to walk with the man and woman, eventually known to us as Adam and Eve. That simple fact is poignant to the point of being distressing, for we see the couple had what most of us crave, a simple, close relationship with God. Oh, to be able to walk among the trees of Paradise with our maker, asking him anything that comes to mind and receiving a clear answer! Before sinning, Adam and Eve thought such walks were perfectly normal, the way things would always be. Shortly after sinning, they were hiding among those trees, fearing the One they had previously trusted as a perfect Father. What they feared and what we fear is that moment of confrontation after sin. Even in our fallen state, we have enough of a sense of God’s righteousness to hate that impending moment. We can spend our lives hiding from it, even running from it. There is nowhere to run, however. If we don’t have that moment of confrontation in this life, we certainly will have it in the next life. We wriggle to find ways to justify ourselves, too, as if we can sort out the blame and defer the punishment on our own. As we see in today’s story, the first sin is also the first example of passing the buck. 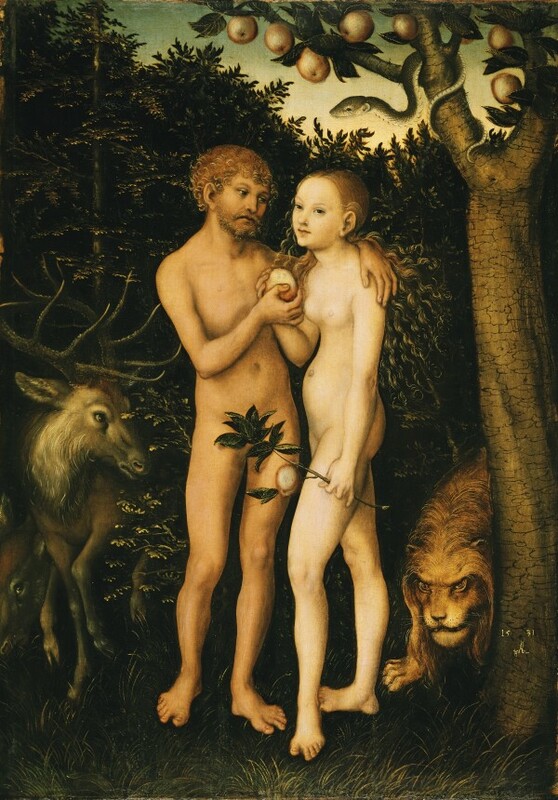 Adam, who was first to hear God’s commandment about the tree, blames Eve. Eve, who clearly knew the simple “don’t eat” commandment, blames the serpent. The serpent—well, he was the agitator, the twister of words who started the problem. The author of Revelation later would associate “that old serpent” with Satan, the ultimate bringer of confusion. To me, the talkative serpent is interesting in that he accepts his curse in silence, knowing he is facing his Creator, just like everyone else. What the man and woman needed, and what we need, is a better way to move through that moment of confrontation. Saying “I did it” doesn’t fix everything. We’re still a long way from the fix, but at least we’re on the right road, the road that passes through repentance to salvation. When Adam and Eve were cast from the Garden of Eden as part of their punishment, they found themselves on that road. God worked through them to begin a change that would make possible our restoration to Paradise. I’m talking, of course, about events revealed in the great narrative of the Bible, the grand story running from Genesis to Revelation. Yes, we are trapped in sin from the moment we are born, and we are put in a position that makes us want to hide from God. For thousands of years, a small group of people we call the Israelites tried to get back into relationship with God by following his law. We cannot get back to God on our own, however. As those Israelites fell in and out of the relationship, humanity remained lost. A new solution was needed. As he did in the garden so long ago, God walked among us for a time as one of those Israelites, raised in a rural place called Galilee. He actually took on flesh for his three-decade walk on Earth, and we call that God-Man Jesus. I hope you know the story and let that story shape your lives. Jesus went so far as to suffer and die for our sins, in the process explaining more deeply the importance of intertwined love and obedience. We repent by saying “I did it, and I regret it. I want to put it behind me.” We believe in what Jesus has done, and we are saved from sin. It is that simple. And in time, we are invited back into the Garden of Eden, the Paradise where we exist in the presence of God. We have different ways of talking about the life to come. “Going to heaven” is one way to describe the experience. We also have elaborate imagery from the Book of Revelation, symbolic scenes of creation restored to holiness and heaven and earth re-joined. What I look forward to is a walk in the garden in the cool of the day with my Savior, asking him whatever comes to mind. The featured image on this blog page is “Expulsion from the Garden of Eden,” Thomas Cole, 1828. Oh, sure, there are people who revel in sin. But I feel certain even they achieved open defiance of God by first practicing an almost naive experiment, a slight turning away from the Creator to see what would happen. The story of the first human sin is the classic example. Whether you read it literally or allegorically, you get to the same place: Sin begins with small, careful steps taken down a very slippery slope. It doesn’t help that someone is looking for company as he slides down. Despite what Flip Wilson said, the devil doesn’t make us do it. He does, however, make right and wrong seem unclear, and suddenly it becomes easy to follow his lead. Now, if you’ve read the story in Genesis, you know that Satan doesn’t actually make a formal appearance. The story of what we sometimes call “The Fall” is built around Eve’s encounter with a serpent. But Revelation refers to Satan as “that ancient serpent” for a reason. Both represent a very personal evil, a dark antagonist seeking to drive a wedge between God and humanity. Eve was like a child in her innocence. She and Adam had just one rule to follow to stay right with God—don’t eat fruit from the tree in the middle of the garden—but the serpent was able to muddle even something that simple. Eve rushed to correct him, but oddly enough, she followed the serpent’s lead in making the rule more restrictive than it actually was. She accurately said the humans were not supposed to eat of the fruit, but she added her own little twist, saying they would die if they merely touched it. Why she did this isn’t completely clear. She had not yet been made when God gave Adam the rule; maybe Adam overstated the matter to keep the astonishing, treasured companion God had given him a safe distance from the tree. Or maybe her inaccurate gloss is just evidence of how quickly we begin to describe God as a harsh taskmaster when we let evil whisper to us. The serpent then sowed further doubt about God, telling Eve she had been misled. God, he told her, was trying to keep the humans from being like their creator. We know where the story goes from there—she took the fruit, passed her self-devised “touch test” with flying colors, and proceeded to dig in, giving some to her husband, too. That’s when they knew they were naked. Not that there was anything wrong with being naked before they ate the fruit. The problem was this fruit gave them knowledge of good and evil, and with all the possible choices in the universe suddenly before them, they felt vulnerable at the potential horrors they could see. And, of course, they who defy God cannot exist for long in the presence of God, and they certainly cannot be allowed near the source of eternal life. Goodbye Paradise. The founder of Methodism, John Wesley, saw a pattern in this story explaining how we step toward and finally slip into sin. It begins in a state of unbelief, a moment where we don’t trust that God is our loving Creator, the one to whom we owe complete allegiance. Unbelief gives birth to pride, Wesley said, resulting in thoughts like “I know as well as God what to do” or even “I know better what to do.” From there, pride leads to self-will, that is, the decision to follow your own thoughts rather than God’s will. Finally, self-will leads to all sorts of foolish desires, wants unconnected to God, and a person ends up eating “forbidden fruit,” usually the indulgence in activities, possessions or people not part of God’s plan. What is a weak, broken human to do? In the story of the fall, all we’re left with is the inevitability of sin, this sudden knowledge that we’re vulnerable. We cannot do anything, of course. We remain dependent on God. Fortunately, God continues to love. God remains the source of grace. Even before banishing Adam and Eve to a world equally broken—a world where they could survive for at least a limited time—God sacrificed some of the precious animals of the garden so their skins could cover the humans’ shame. It was a precursor to the great sacrifice of Jesus on the cross, just as all the animal sacrifices to God in human history would be. I find it poetic that Jesus Christ, God walking among us in our flesh, preceded his ministry to rescue us from sin by going toe to toe with Satan, in the process reversing the pattern of temptation we see in Genesis. From the story, it is obvious the devil was unsure of Jesus’ identity. Satan’s first strategy was to deal with Jesus as a fallen human, one already familiar with the pattern of temptation and rooted in sin. Satan began by placing before the fasting, hungry Jesus a temptation based on foolish desire: Turn these stones into bread. “One does not live by bread alone, but by every word that comes from the mouth of God,” Jesus replied. The devil then appealed to Jesus’ pride, testing to see if he would willfully demonstrate holy power: Throw yourself from the pinnacle of the temple, he told Jesus. “Again, it is written, ‘Do not put the Lord your God to the test,’ ” Jesus said. Here is one who did not fall, one worthy of Paradise. And when we trust in the sacrifice Jesus made on the cross, we know we can return to that blissful place, too.